Hunter Wheel alignment (also called tracking or balancing) refers to the angle and direction of the vehicle’s tyres. It can be adjusted to affect the vehicle’s road handling, reduce fuel consumption and increase the life of the tyres. If your vehicle pulls to one side, or if you have uneven tyre wear then it may be a problem with your tracking. It can go out of alignment if you hit a kerb or pothole. Our skilled and trained technicians can fix all your Ellesmere Port wheel tracking problems. 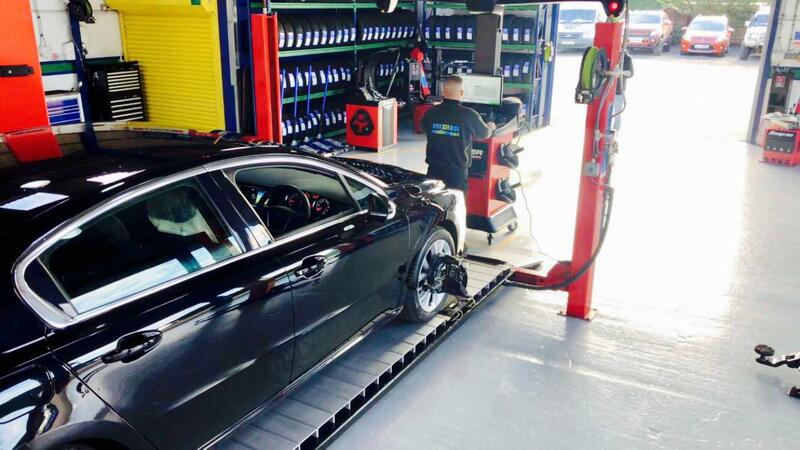 At Car Clinic MOT Centre, we use the Hunter Elite Tracking System for caster, camber and toe wheel alignment. It is widely regarded as one of the best wheel tracking tools available. We offer Hunter wheel alignment with standard toe adjustment for £40 + Vat. Full 4-way caster camber toe adjustment is £70 + VAT. A courtesy car is always available subject to terms and conditions. What is Hunter Wheel Alignment? Our Hunter wheel alignment Ellesmere Port service measures up to 14 wheel angles and compares them to the original specifications that are laid down by the vehicle’s manufacturer. If there are differences then we correct them by adjusting the steering and suspension settings, which maximises fuel efficiency, reduces uneven tyre wear and improves the comfort and safety of the car. After your service you are issued with two documents: The first shows the alignment settings of your car and the manufacturer’s specifications; the second shows the settings after any agreed adjustment work that was undertaken by our IMI accredited technicians. Car Clinic MOT Centre are your local experts for MOT Ellesmere Port, tyres and car repairs. For a free Ellesmere Port tyres quote or a car repairs Ellesmere Port quote, just call us on 0151 3390101 or pop into our Ellesmere Port garage at your convenience.